Happy New Year everyone!! I hope 2016 brings you blessings. Several months ago, Chubby Hubby ordered the DDP yoga program. He has struggled with sciatica for years and when he saw Arthur’s video (found here) he immediately told me he wanted to order the program. **Side note, watch this when you can, its incredibly inspirational! ** I was skeptical, because we all have those DVD’s we order “to get healthy” that gather dust shortly after arriving. He pushed, I gave in, and he began doing them religiously and lost about 45 pounds. I was so super proud of him for a) proving me wrong (really, I was! ); b) sticking to it; and c) his success and how good he felt. …Then the holidays came…we all know the story. A little here, a little there, and we end up hating ourselves between Christmas and New Years. So, Chubby Hubby sent me a link to this Buzzfeed 7 “clean” eating challenge. We both were talking a lot about how badly we’d been eating and how much we needed to get back on the horse. As he said, “there’s nothing on here I wouldn’t eat”, so I set to the grocery store to purchase items for said diet challenge. Here is the link for the plan. The site is great that it has a shopping list, nutrition facts, and tips to save money. Also, if needed, prep help videos. Check it out and follow along! Things I learned from this shopping trip: First, apparently Chubby Hubby had simply made a suggestion with this plan–I thought he was really urging us to do it, but apparently he was introducing it for consideration…oops. I called him and told him to meet me at the grocery store to buy for the plan. He seemed surprised, but game. Secondly, and very importantly: This plan ain’t cheap. The plan mentions that the specifications/amounts are for 1 person and differ slightly according to gender. I pushed my l’il buggy to the produce section fully intending to buy double the list to feed us both. Around the pomegranates and acorn squash(es) I vetoed this part of the plan. I figured that since I’m a bariatric post-op patient (story for another day), surely we can share and just supplement any necessary foods. Of course, not everything on the list was at one store, so I finished up the list this afternoon. …that took about 4 hours. Now, to be fair, there were a couple of things that delayed the process. 1) Cleaning the kitchen — call it my inner chef desperate to have my “Mise en place” in order, but I had to clean the kitchen before I started. This took time since pots had to be washed by hand and counters had to be cleared and cleaned. 2) Making one item at a time. Once all was said and done, I realized it would have been faster to prep several of the dishes concurrently, such as seeding the pomegranate while the egg whites were whipping (which took a lot longer than I thought it would by the way). The actual preparation of the food was really not that hard, I was just slow and careful throughout but that definitely slowed the process. Oh well, live and learn. Frittata — I’m not big on sweet potatoes or onions, so I passed on this one. Chubby Hubby really enjoyed it though, he said he’d like to have it again at some point (which is good, since the plan instructs him to eat the leftovers for lunch at some point). Spinach salad with tofu — Full disclosure, I had never had tofu before. I was very pleasantly surprised, and Chubby Hubby walked in the door from work and said “that salad you made me — was EXCELLENT.” I told him I was glad, I had been worried he would be starving and he said “surprisingly, no, I’m good.” The orange vinegarette dressing had a nice pop. I just wish the chickpeas were crunchy, like, at all. I followed the instructions on roasting them, maybe next time I’ll just buy the ones that are already roasted. 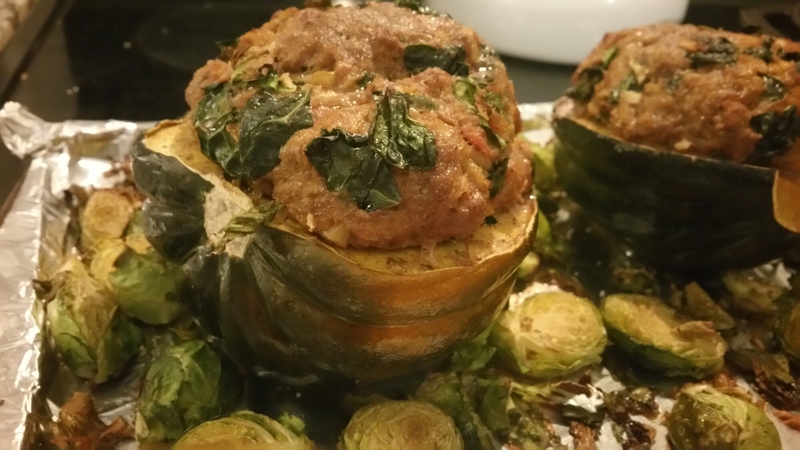 Turkey Stuffed Acorn Squash and Brussel Sprouts — “This is great, you should make this every night!” Chubby Hubby gave this one a big thumbs-up seal of approval. 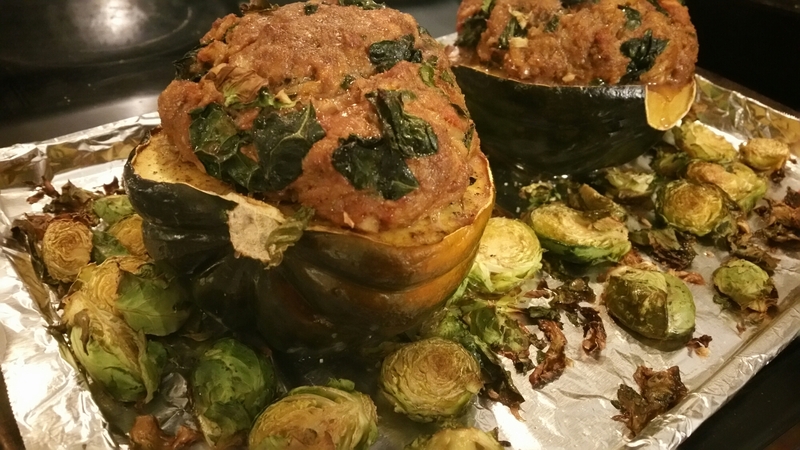 I liked it, I’m not a huge fan of squashes in general, but I liked the one dish prep, the Brussel sprouts, and the flavors of the turkey. Maybe next time a bit fewer onions and chop the kale a little finer for me. Chubby Hubby says I’m crazy (which he does a lot anyway) and that its perfect the way it is. 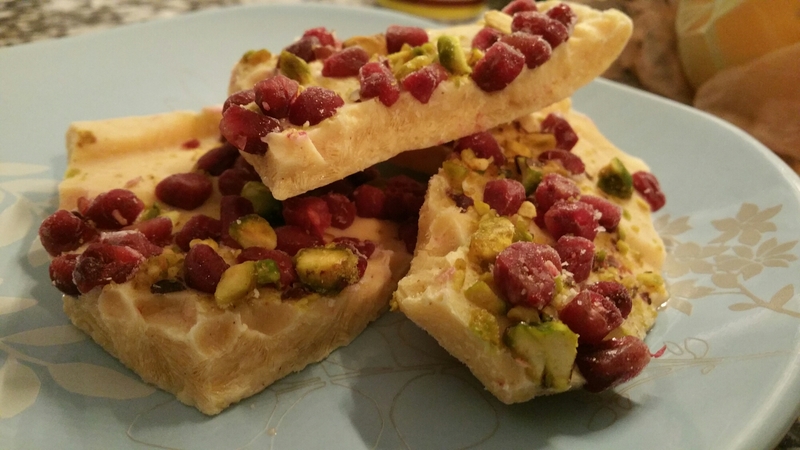 Snacks for Day 1 are pomegranate seeds and raw almonds during the day, and dark chocolate at night. We cheated with the almonds as I had roasted ones on hand, so I used those. Pomegranate seeds though, who knew?! Those suckers are delicious.